Each year, 600 to 800 UCSB students enroll in the introductory biology laboratory course at UCSB. Now, as part of the UCSB-HHMI science education program, these beginning biology students will conduct novel experiments and contribute to the world-wide research effort in genomic biology. 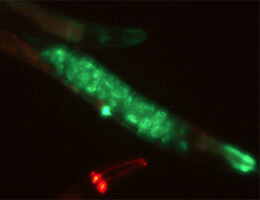 The model system used in these experiments is the humble roundworm, Caenorhapbditis elegans. Each student will use RNA interference to knock down one of the worm's 20,000 genes in an effort to identify which genes are important for specific aspects of development or physiology. It will be true research, as the outcome of each experiment will not be known beforehand. The focus is on experimental design, data analysis, and sharing of data. The university will share the students' results with the worldwide C. elegans research community by publishing their data on the web. Those results could stimulate new directions for researchers around the world. Online Presentation by Joel Rothman, Director of the UCSB-HHMI Undergraduate Science Education Program "C. elegans as a model organism"
LURE project was implemented during the Summer Session 2011 and has continued since during the summer and winter offerings of MCDB1BL/EEMB2L. During Winter quarter, 600+ introductory biology students participate in LURE project. Online Presentation by Joel Rothman "C. elegans as a model organism"